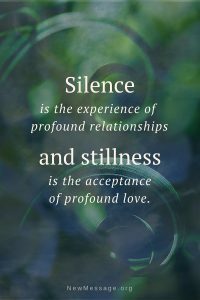 A profound stillness practice is developed through Steps to Knowledge: The Book of Inner Knowing. This sacred text is a meditation guide book and spiritual teacher on the level of the greatest spiritual and religious texts ever written. Steps takes you on the journey of discovering Knowledge, the mysterious source of your inner power and authority. Following this inner intelligence, called Knowledge, leads you to the essential relationships that you will need to find and to fulfill your higher purpose in life. At some point, it is necessary to begin a spiritual practice because you have to learn to redirect your mind and to open yourself to a deeper experience. 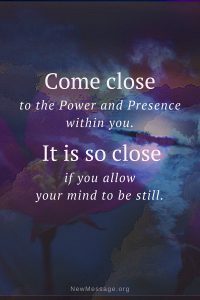 Why is Stillness of mind essential? Its rewards are quite apparent, if you think about it. 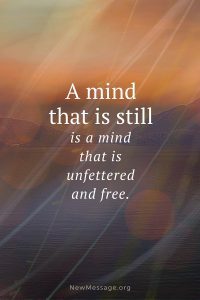 A still mind is a focused mind. It is a mind that is using all of its resources. When your mind is quiet, you are not trying to give the situation answers or explanations, so you are able to witness things as they truly exist. Simple enough, but very profound. To practice stillness, let all things come to a rest except the keenness of your mind. Here your mind is all looking and no thinking. Your ears are all listening. Your body is all feeling. Explore the depth and rewards of Stillness with the compassionate guidance of Steps to Knowledge. This Knowledge is essential to the cultivation of stillness and to the resolution of personal difficulties. No matter what you are facing in life, no matter what you have or do not have, develop stillness of mind. When you have reached the point of discovering, or beginning to discover, your greater work in the world, you will need the power of this Presence to give you strength and confidence. You will need its reprieve, its peace, its depth and the power of its relationship to you. It will give you courage and greater determination. Here the Presence serves as a reminder of why you have come and the power of Knowledge you have brought with you. Listen deeply to The Night Meditation and be guided to the Power and Presence within you. Feel the Presence. Think of the Presence. Sense the Presence. Use the marvelous instrument of your mind and your body to become receptive to the Presence. It is your spiritual practice that will bring your mind and your body into real relationship with your deeper nature. This will give you a sense of integrity. This will allow you to feel right about your life. This will give you the criteria to bring your life into balance and harmony. Follow us and share this Wisdom with others from the accompanying Pure Guided Meditation Facebook page. – Be notified when new messages and videos are available. – Mailings are sent about once a week. – Your Privacy will be honored. – You may unsubscribe at any time.